How to apply for Singareni Collieries Company Executive,Non-Executive Posts 2017. Singareni Collieries Company Ltd. - 750 Executive, Non- Executive Posts, Last date: 10.10.2017. How to apply or Upload the Application form, Last date for submission of online applications, Mode of Fee Payment and Schedule of Opening and Closing of Online application form details are given here. 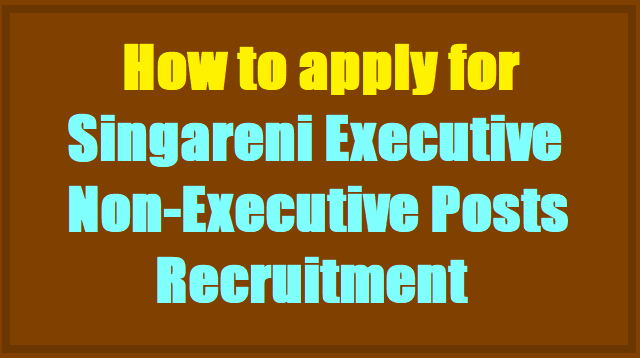 The Singareni Collieries Company Limited, Kothagudem Collieries invites applications for Executive, Non- Executive Cadre vacancies. Qualification: BE/ B.Tech/ AMIE(Mining) with minimum of 55% marks in aggregate. Age: Minimum 18 years and maximum 30 years. Qualification: BE/B.Tech/ AMIE IN Electrical, Mechanical or Electrical & Electronics Engg. with a minimum of 55% marks in aggregate. Qualification: M.Sc.(Tech.) Hydrogeology/ M.Sc. (Applied Geology)/ M.Sc. Geology with minimum 60% marks in aggregate. Experience in Hydrogeological works or specialisation in Hydrogeology is desirable. Qualification: M.Sc./ M.Tech. in Geophysics or Applied Geophysics with Minimum 60% Marks in aggregate. Qualification: Diploma in Mechanical Engineering (D.M.E.). Qualification: Diploma in Electrical and Electronics Engineering (D.E.E). Qualification: SSC and National Trade Certificate (ITI) in Fitter Trade and holder of National Apprentice Certificate in Fitter Trade issued by National Council for Vocational Training. Qualification: Candidate should possess SSC, National Trade Certificate (ITI) in Electrician Trade and holder of National Apprentice Certificate in Electrician Trade issued by National Council for Vocational Training. Qualification: Pass in SSC. National Trade Certificate in Trade of Turner/ Machinist after 2 years institutional Study/ training at ITI. National Apprentice Certificate issued by NCVT after 1 year training under apprentices Act & Pass in all India Trade Test. Qualification: Diploma in Metallurgy Engineering. 8 year experience in reputed Steel Foundry as ‘Melter’. Conversant with I.S. Specifications of different alloy steel. Qualification: Pass in SSC. ITI Certificate in Moulder Trade. Pass in prescribed Moulder Trade Test Conducted by National Council for Training in Vocational Trades (NCTVT). Qualification: Pass in SSC. National Trade Certificate in Motor Mechanic Trade. National apprentice certificate issued by NCVT. Method of selection: Written test only. Last date for submission of online applications: 10.10.2017. 1) The candidate should ensure the age criteria mentioned in the Notification and the date of birth of the candidate mentioned in the online application should tally with the date of birth recorded in the SSC records. Further they have to ensure uploading of signature and photo. Candidates fail to upload the specified size of photo and signature in the online application will not be considered. 2) To ascertain the Local/Non-Local Status, the candidate has to check the parameters i.e., IV to X Class Study details mentioned in the Notification and ensure whether he/she belongs to Local or Non-Local. 3) Candidate has to furnish the Caste details basing on the Latest Caste Certificate obtained 6 months prior to the date of Notification. 4) Candidate has to possess invariably the specified qualification mentioned against the post in the notification. Possessing higher qualification or any other qualification without the basic specified qualification for the post will not be considered. 5) If any candidate selected for the post who is working in the Govt. Organisations, Banks etc., has to submit relieving letter within a week period after verification of certificates and declared fit for the post failing which his candidature will be cancelled automatically. No correspondence will be entertained in this regard. Note: Based on the information uploaded by the candidate, he/she is made eligible for issuance of Hall ticket. If the candidate fails to produce documentary proof for the information furnished / uploaded by him/her in the online application, the candidature of such candidates, if selected provisionally, will be rejected at the time of reporting for verification of Original Certificates and the claim of the candidate to consider his case, will not be entertained. iii) Upload all details of the Candidates in the respective Columns of Online Application form. The details once entered, cannot be altered at a later date. Submission of any false or incorrect information or suppression of any factual information at any stage by the candidate is liable for disqualification of his candidature. iv) Candidates have to take a print of the ONLINE Application Data Sheet after successful submission of data. v) Candidates have to submit one application only for eligible post. More than one application received for same post will be rejected. vi) Candidates are advised not to change their Mobile Number and photo given in the online application forma till completion of selection process. NOTE :CANDIDATES ARE ADVISED NOT TO SEND PRINT APPLICATION ALONG WITH ANY ENCLOSURE. ii) Last date for submission of Online Applications: 10.10.2017 upto 5.00PM. iii) The candidates who possess requisite qualification may apply On-line by satisfying themselves about the terms and conditions of this recruitment. a) On successful submission of online application, for the purpose of Payment of Application Processing Fee, two Reference Numbers i.e., SCCL Reference Number-1 and SCCL Reference Number-2 will appear on the Screen and the same has to be noted by the candidates before clicking on the Bank Payment Link. 6. Date of birth etc. c) Once the above details are filled and the Form is submitted, the candidate will be directed to the Payment Form where he can choose a suitable mode of Payment from the following. d) The candidates who are exempted from Payment of Application Fee as per Notification i.e., SC, ST and internal candidates need not click the Bank Payment Link. In such a case, on successful submission of application, the Reference Number will appear on the Screen as “NOT APPLICABLE”. e) The SCCL Reference No.1 and SCCL Reference No.2 should be invariably correctly entered in order to validate your payment. A wrong entry of these numbers will make your payment void. Fee once remitted shall not be refunded or adjusted under any circumstances. Failure to pay the Application Processing Fee (if applicable) and wrong entry of SCCL Reference Numbers will entail total rejection of the application.